With a fast lap of 192.397 mph/28.067 seconds in the third and final round of NASCAR Sprint Cup Series qualifying at Kansas Speedway near Kansas City, Kan., on Friday, Joey Logano claimed the pole for Saturday night’s SpongeBob SquarePants 400 at the track. 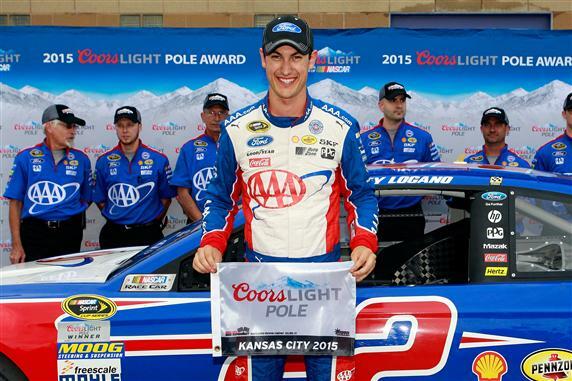 It’s Logano’s series-leading fourth pole start of the season and the 12th of his career. “That AAA Ford Fusion was on a rail and did whatever I asked it to do,” Logano said. The pole snapped Kevin Harvick’s streak of consecutive Kansas pole at three. Harvick qualified sixth. Logano was fast in the first round, posting a lap that was second-fastest to round-leading Carl Edwards. In the second round, though, Logano didn’t crack the top-five. Logano will share the front row with Kasey Kahne on Saturday. Brad Keselowski and Martin Truex Jr. will line up in the second row, in the third and fourth spots on the grid. After turning in the fastest lap in round one and second-fastest in round two, Edwards wound up fifth in the final pole-determining round. Meanwhile, Greg Biffle became the first Roush Fenway Racing driver to get to the third round of a qualifying session, so far, in 2015. He qualified seventh. “We just got a little better speed in our car, and this race track has been pretty good for us,” Biffle said.